1. Seuna Yadavas of Devagiri (850–1334) at its peak ruled a kingdom stretching from the Tungabhadra to the Narmada rivers, including present-day Maharashtra, north Karnataka and parts of Madhya Pradesh, from its capital at Devagiri (present-day Daulatabad in modern Maharashtra). 2. The Yadavas initially ruled as feudatories of the Western Chalukyas. Around the middle of the 12th century, as the Chalukya power waned, they declared independence and established rule that reached its peak under Singhana II. 3. The Seuna dynasty descended from the Chandravanshi Yadavas (Yaduvanshis) of north India. According to verse 21 of Vratakhand (a Sanskrit work by Hemadri), the Seunas were originally from Mathura and later moved to Dwaraka. Hemdari calls them Krishnakulotpanna (i.e., descendants of Lord Krishna). 4. The Marathi saint Dnyaneshwar describes them as yadukulvansh tilak. Some Seuna inscriptions call them Dvaravatipuravaradhishvaras ("masters of Dvaravati or Dwaraka"). 5. Jijabai (the mother of Shivaji, who founded the Maratha Empire) belonged to the clan of jadhavas of Sindkhed Raja, who also descended from the Yadavas. 1. Seunas were once the feudatories of the Rashtrakutas and then of the Western Chalukyas. 2. The founder of the Suena dynasty was Dridhaprahara, the son of Subahu. 3. According to Vratakhanda, his capital was Shrinagara. However, an early inscription suggests that Chandradityapura (modern Chandor in the Nasik district) was the capital. 4. The name Seuna comes from Dridhaprahara's son, Seunachandra, who originally ruled a region called Seunadesha (present-day Khandesh). 5. Bhillama II, a later ruler in the dynasty, assisted Tailapa III in his war with the Paramara king Munja. 6. Seunachandra II helped Vikramaditya VI in gaining his throne. 1. Bhillama V (1173–1192), son of Mallugi, established the sovereign Seuna kingdom. 2. He took over the Chalukya capital of Kalyani in 1190 and founded Devagiri (now Daulatabad) as the capital of the Yadava dynasty. 3. The Seunas were bordered by aggressive neighbours on all sides: Paramara rulers of Malwa in the north, Kakatiya dynasty in the east, Hoysalas in the south and Solanki rulers of Gujarat in the west. 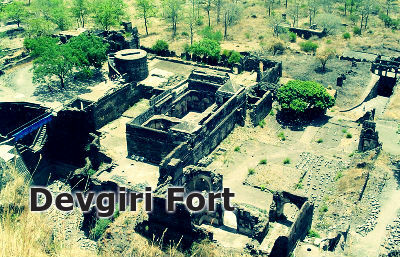 As a precaution, they built their citadel at Devagiri. 1. Singhana II 1200–1247 C.E. is considered the greatest ruler of the Yadava dynasty. 2. During his rule the kingdom expanded from Narmada to Tungabhadra, reaching its zenith at the expense of Hoysalas in the south, Kakatiya dynasty in the east, Paramaras and Chalukyas in the north. 3. He founded the town Shinghanapur (or Singhanapur). 4. He was a great patron of learning and literature. He established the college of astronomy to study the work of celebrated astronomer Bhaskaracharya. 5. The Sangita Ratnakara, an authoritative Sanskrit work on Indian music was written by Sharngadeva during Singhana II's reign. He also patronized Changadeva, the Kannada poet Kamalabhava. 1. Ramachandra, the grandson of Singhana II, ruled from 1271 to 1309 CE. 2. Hemadri (or Hemadpant) was Ramachandra's Shrikaranadhipa (Chief Minister). He compiled the encyclopedic Sanskrit work Chaturvarga Chintamani. He is said to have built many temples in a style known after him – Hemadapanti. He also invented the Modi script for writing Marathi. Hemadri wrote many books on vaidhyakshastra (medical science) and he introduced and supported bajra cultivation. 3. In 1294, Ala-ud-din Khalji captured Devagiri. Khalji restored it to Ramachandra in return for his promise of payment of a high ransom and an annual tribute. 4. However, this was not paid and the Seuna kingdom's arrears to the Khalji dynasty kept mounting. In 1307, Khalji sent an army commanded by Malik Kafur to Devagiri. Ramachandra was taken to Delhi. Khalji reinstated Ramachandra in return for a promise to help Khalji subdue the Hindu kingdoms in South India. In 1310, Malik Kafur mounted an assault on the Kakatiya dynasty from Devagiri. 5. Alauddin Khilji invaded Devagiri once when he was the crown prince. Alauddin Khilji once again invaded Devagiri in 1307. The invincible Malik Kafur was on the spearhead of the army. He was accompanied with Khwaja Haji. The governors of Malwa and Gujarat were ordered to help Malik Kafur. The huge army conquered Devagiri almost without a battle. Alauddin Khilji appointed Raja Ramchandra the governor of Devagiri. He was given the title "Rai Rayan" (king of kings). 1. Ramachandra's successor Singhana III challenged the supremacy of Khalji, who sent Malik Kafur to recapture Devagiri in 1311. 2. Singhana III was killed in the ensuing battle and Khalji's army occupied Devagiri. 3. The kingdom was annexed by the Khalji empire in 1317.